Thorstein Egilsson was the third and youngest son of the tenth-century Icelandic warrior-poet, Egil Skallagrimsson. Egil was getting old and decided it was time to hand over the farm at Borg. Thorstein’s elder brothers, Bothvar and Gunnar, had both died early in life, so the duty of taking over the farm fell to him. Borg was first settled by his grandfather, Skallagrim. Thorstein married Jofrid and together they had ten children. Grim was their eldest son, and Skuli the second. Of their daughters Helga was reputed to be the most beautiful girl in all Iceland. When Skallagrim came to Iceland he claimed the territory around Borg and in time granted plots of land to his friends. One of these was Ani who settled and started farming at Anabrekka. Being good neighbours they respected each other and the boundary markers separating their fields, as did their respective sons, Egil and Onund. When Onund turned old he passed Anabrekka on to his son, Steinar. Steinar was said to be a cantankerous troublemaker, and Thorstein soon found this to be true. Thorstein’s fields lay to the south of the brook Hafslaek, which marked the boundary between their properties. Stakksmyri was a moor on Thorstein’s side of the stream, boasting rich grass ideal for grazing cattle. Steinar took no notice of the boundary and continually allowed his cattle to encroach on Thorstein’s pasture. Likewise, he took no heed of Thorstein’s request that he stop. Rather, he charged Grani, one of his farmhands, to keep watch over the herd as they grazed on Stakksmyri. Thorstein was infuriated by this insult and chased Grani to the milking shed where he killed him. Steinar wasted no time. He bought a slave called Thrand, tall and stronger than most men. Steinar gave Thrand a large axe with a long razor-sharp blade, and the task of watching the cattle as Grani had done before. Despite his towering size and hefty weaponry Thrand fared no better. Thorstein soon sliced through his neck with his axe. Steinar was incensed and rode immediately to Borg where he confronted Thorstein over the killings. Thorstein denied nothing, and furthermore stated that he would go on killing, even Steinar himself, as long as his cattle were found grazing on Stakksmyri. Steinar would not be dissuaded and raised a suit against Thorstein summonsing him to court under threat of outlawry. Thorstein didn’t seem too concerned. When the time came for the case to be heard a troop of eighty armed men, ready for battle with gleaming shields, rode magnificently into the assembly. Egil Skallagrimsson had arrived. The outcome was but a formality. Steinar lost both the case and his land, being formally evicted from Anabrekka. That autumn Thorstein’s good friend, Thorgeir, invited him to a harvest feast south at Alftanes. He set off taking with him five companions, including Grim who was ten years old at the time. Not long into their journey they were set upon by Steinar and a band of armed men. Battle ensued and they hacked at each other with their axes. When the frenzy calmed down several were found to be maimed and four lay dead, including Steinar’s ten year old son. Alongside lay Grim wounded, and he too died soon after. This unfortunate skirmish marked the end of the feud between Thorstein and Steinar. Some years later an ambitious young man by the name of Gunnlaug Serpent-tongue came to stay at Borg. His plans to travel abroad were somewhat complicated when he fell in love with Helga. Undeterred Gunnlaug set sail for Norway with a promise that he would return for his beautiful bride. On arrival in Trondheim he met up with Skuli, who was then serving at the court of Jarl Erik Haakonsson. Icelandic seafarers used Shetland as a vital stop off point, and the beaches along the west coast no doubt proved attractive. The Collecting Sheet depicts Thorstein landing at Spiggie. He may well have joined Skuli on one of his many adventures, but the sagas are unfortunately silent. Thorstein lived to an old age. 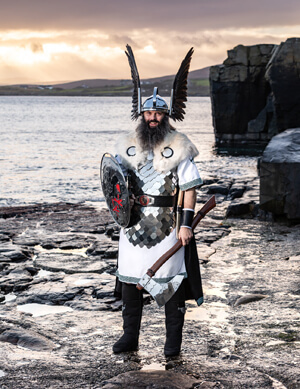 When he died Skuli gave up the Viking life, and returning to Iceland lived out his days at Borg.